In August it was the HO scale M & M Sub. 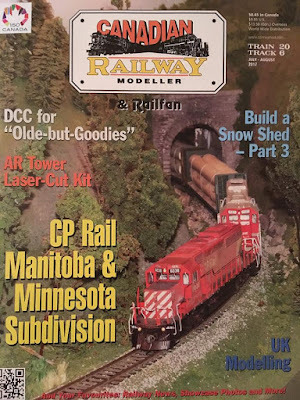 on the cover of Canadian Railway Modeller. 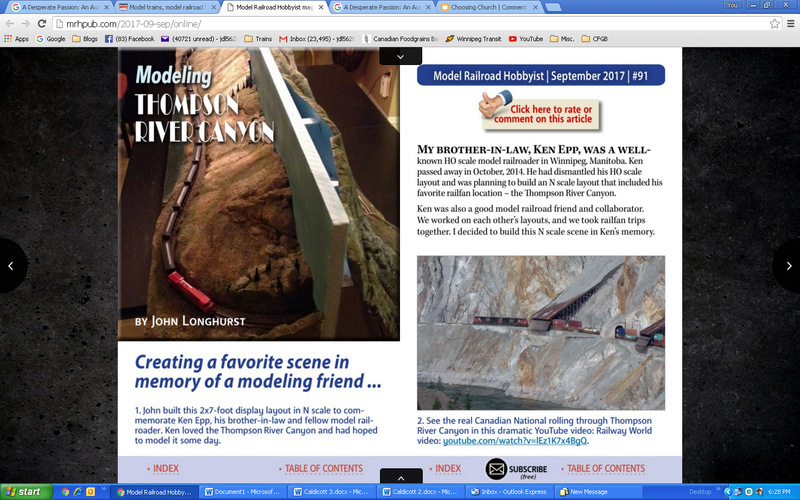 Now my Thompson River Canyon N scale layout is in the September issue of Model Railroad Hobbyist. Getting in a magazine is always special, but this is a special honour since the layout was created in memory of my brother-in-law Ken Epp, who died of cancer in 2014. Before he died, he was planning to build an N scale layout based on his favorite railfan area, the Thompson River Canyon in B.C. Since he died before he could do that, I decided to build it for him. In this case, it was a simple loop on a 2 x 7 hollow core door. While many have seen the layout on this blog, it’s great to be able to share it, and my memory of Ken, with many others through MRH. You can read the whole issue, and read the article, here. Total Solar Eclipse on the M & M Sub. 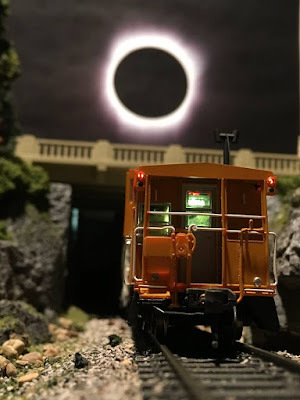 Anyone else catch the total solar eclipse on their layout yesterday? In 1973, they made it—in caricature, at least. I have no aspirations for the cover of that magazine, but I was interested in getting the Manitoba & Minnesota Sub. on the cover of a model railroad magazine one day—and now it’s happened. This summer the layout made the cover of Canadian Railway Modeller. It had appeared in the magazine before, but not on the cover. The article inside describes the layout—its construction, background and operation. In this Internet age, magazines are becoming old technology. But there is still something satisfying about getting in a printed publication—especially on the cover. 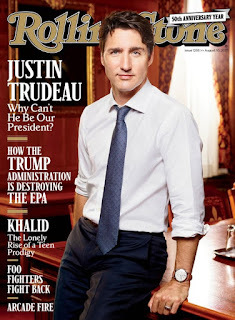 If you don’t believe me, ask Canada’s Prime Minister. England has the Magna Carta (1215). America has the Declaration of Independence (1776). France has the Declaration of the Rights of Man and of the Citizen (1789). 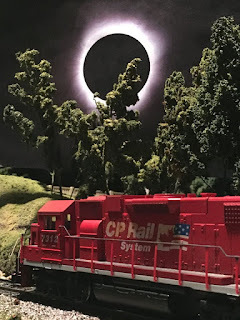 And the CP Rail Manitoba & Minnesota Subdivision has the bill of sale from Bobbye Hall’s Hobby House in Dallas, TX (1987). I know this, because I found it the other day. I wasn't looking for it; I was going through a filing cabinet looking for an old warranty when I came across an archive file. There were a number of keepsakes in there—bills of sale for our first few cars, our first house, things like that. Also in the file—thanks to my wife, who hangs on to these things—was the handwritten bill of sale for the first model railroad equipment I bought 30 years ago when I got back into the hobby. Dated May 25, 1987, it was just before we left Dallas after living there for two years to head back to Manitoba. Before we left, I went to Bobbye Hall’s, a legendary Dallas model railroad store, and bought six pieces of rolling stock and a locomotive for $39.64. As I have written before, I had been into trains since a young child but sold my N scale stuff in 1976 before leaving for college. It was 11 years before I got back into the hobby, with a trip to Bobbye Hall’s. And now, 30 years and two layouts later, here is the founding document of my model railroad journey. All but one of those original items are long gone now. But through this old bill of sale, I can remember when it all began. Bowser Red Barn Finally on the M & M Sub. Finally! 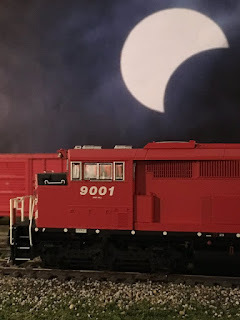 My SD40-2F Red Barn from Bowser is on the layout and racking up miles. The unit arrived a week ago, while I was out of town. It had its first run two days ago. Like my other Bowser SD40-2 units, it looks great and runs like a dream. A great looking and great running Red Barn has been on my wish list for years. Until now, the only way to get this model was to buy brass, kitbash or use the old Associated Model Makers (AMM) resin kit. I’ve actually had an AMM Red Barn for about 15 years. I bought it used from a local hobby shop. The Bowser unit (l) next to the old AMM unit. It’s a crude effort (someone called it a “bar of soap”), and apparently very hard to work with. My model is on an Athearn Blue Box chassis. It runs OK. Considering the lack of alternatives, it was great for its time. So when Bowser announced its Red Barn models, I was ecstatic. And now I finally have one! With the addition of the Red Barn, I can’t think of any more locomotives that the M & M Sub. would need. Of course, there’s always the GP9u chop nose that Bowser plans to bring out . . . yes, I could always appreciate one of those. Click here to read more about the history of this unique unit.